In May–June 2016, a trial excavation was conducted south of Tel Bet Shemesh (Permit No. A-7709; map ref. 197456–594/628310–81; Fig. 1), prior to widening Highway 38. 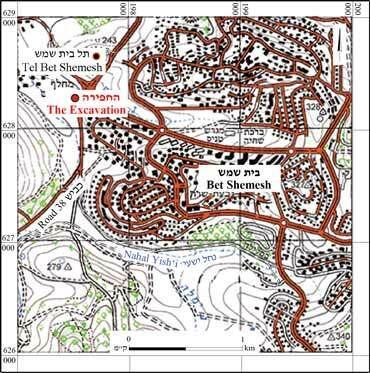 The excavation, undertaken on behalf of the Israel Antiquities Authority and financed by Netivei Israel – the National Transportation Infrastructure Company, Ltd, was directed by N. Ben-Ari (photography), with the assistance of A. Nagar (antiquities inspection), M. Shor (preliminary inspections), N. Nehama (administration), M. Kahan and Y. Shmidov (surveying), A. Peretz (photography), A. Shadman and A. Eirikh-Rose (consultation), E. Belashov (plans), Y. Rapuano (pottery reading), I. Lidsky-Reznikov (pottery drawing) and A. Goel (numismatics). 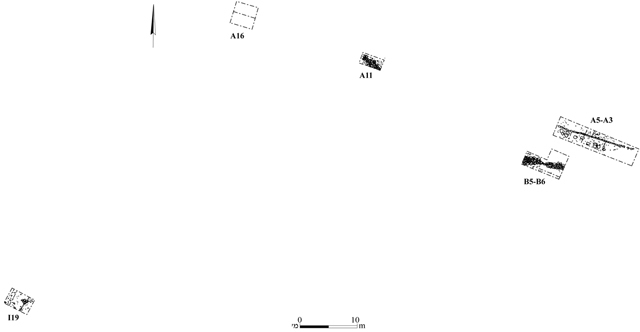 Seven excavation squares (A3, A5, A11, A16, B5, B6, I19; Fig. 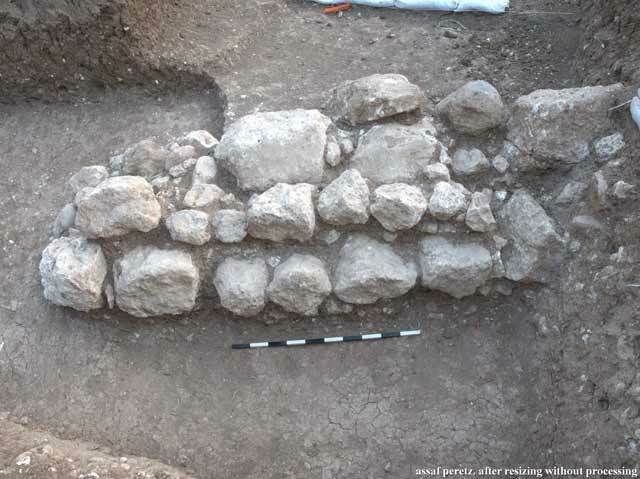 2) were opened in an olive grove on the Nahal Yishʽi floodplain, c. 300 m south of Tel Bet Shemesh, yielding field walls and stone concentrations. 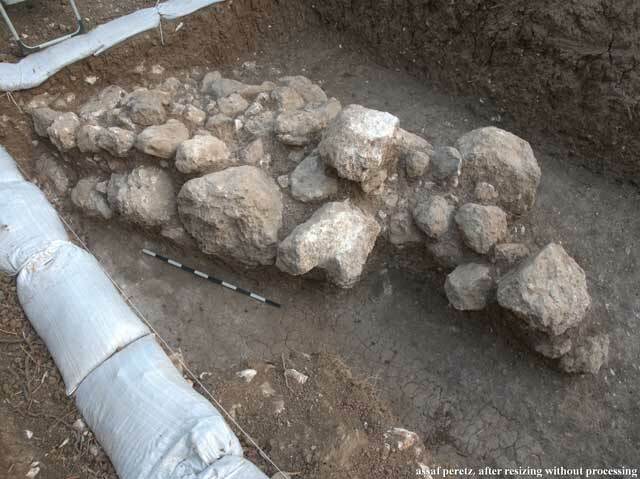 Past excavations at Tel Bet Shemesh unearthed a settlement sequence dating from the Middle Bronze Age to the Iron Age II and a large building from the Byzantine period (Tzaferis 1969; Bunimovitz and Lederman 2016; Mackenzie et al. 2016). Settlement strata dating from the Iron IIB and IIC, Byzantine, Early Islamic, Mamluk and Ottoman periods were recently exposed east of the tell (Permit Nos. A-6439, A-6836, A-7802). Some 800 m southwest of the excavation squares is Horbat Gannim, where a settlement sequence ranging from the Hellenistic to the Early Islamic periods were previously uncovered (Kogan-Zehavi 2016; Sion and Rapuano 2017). Several whole pottery vessels from the second half of the second century BCE and a lime kiln that was apparently built at the end of the Byzantine period–beginning of the Early Islamic period were recently exposed on the outskirts of Horbat Gannim (Permit No. A-7536). Squares A3, A5 (Figs. 3, 4). A wall (W106; exposed length 14 m, max. 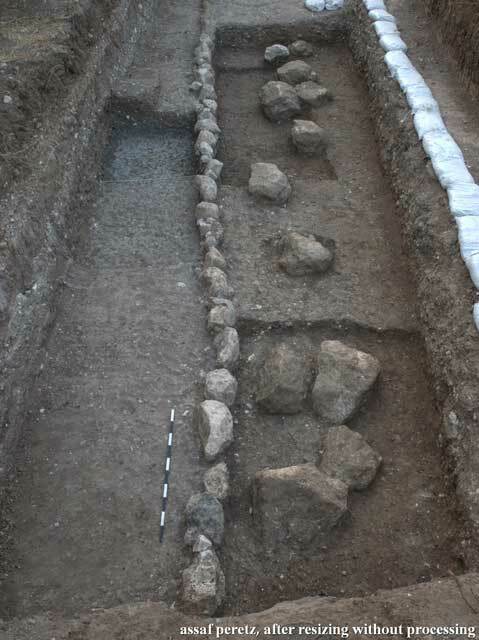 width 0.4 m) built of a single row of medium-sized fieldstones and a few small fieldstones founded on alluvium was discovered below a thick layer of alluvium that was devoid of finds; the wall was preserved to a height of one course. A row of large fieldstones (L118; length c. 10 m, max. 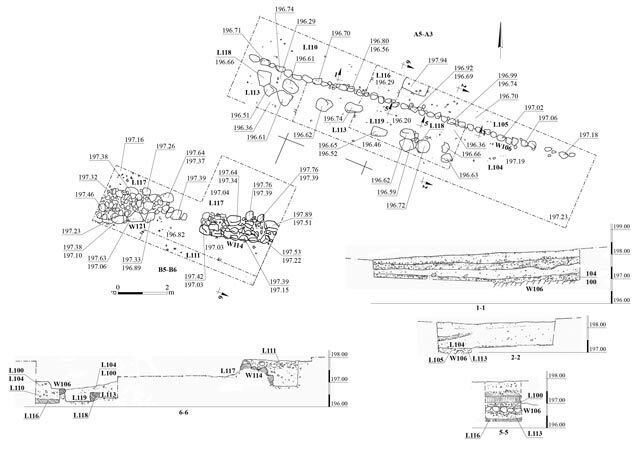 width 1.5 m) was exposed parallel to the southern side of W106; some of the stones were in clusters. Wall 106 may possibly have been intended to demarcate cultivation plots, or it may have been a remnant of a road. The row of stones may have been part of a collapsed wall, which did not survive or was not exposed. Fragments of pottery vessels were discovered, including bowls (Fig. 5:1–9), kraters (Fig. 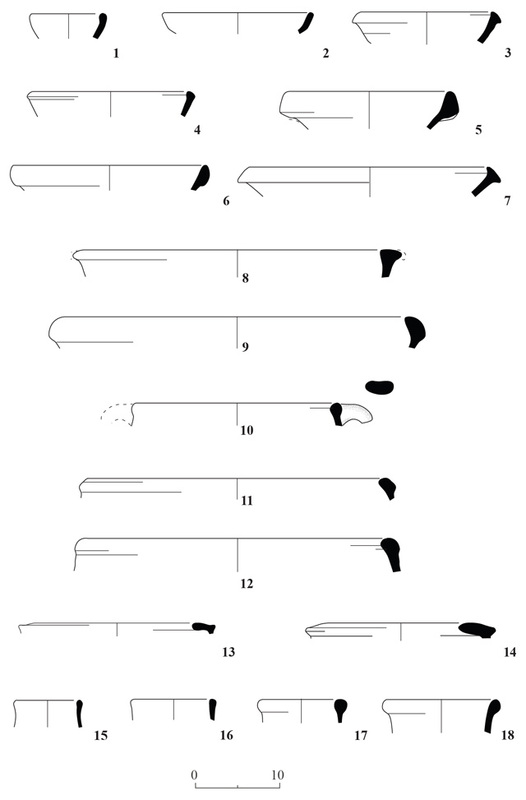 5:10–12), holemouths (Fig. 5:13, 14) and jars (Fig. 5:15–17) from the Iron II; jugs from the end of the Hellenistic period (Fig. 6:1, 2); a krater (Fig. 6:4), a cooking pot (Fig. 6:5) and jars (Fig. 6:6–8, 10) from the Early Roman period; jars that were common throughout the Roman period (Fig. 6:11, 12); and a bowl from the Late Roman or Byzantine period (Fig. 6:14). A bronze coin of Agrippa I that was minted in Jerusalem in the years 41–42 CE was also discovered (IAA 158794). Square A11 (Fig. 7). A concentration of medium and large stones (L109; length c. 4 m, max. width 1.85 m) was discovered beneath a thick layer of alluvium devoid of finds; the latter was partially removed by a backhoe. White calcareous soil was exposed on either side of the stone concentration. The soil probably originated from the weathered bedrock that was wet and muddy, and from which groundwater flowed. Alluvium was removed southwest of the square, exposing another part of the stone concentration, which apparently continued for additional 2.5 m to the southwest. It is possible that the concentration of stones is the collapse of a wall that stood there in the past. Square A16 (see Fig. 7). Beneath a layer of alluvium mixed with small stones (L102, L103) was a thick layer of alluvium devoid of finds. Groundwater (2 m below L103) was encountered beneath these layers. The pottery included a jar from the Iron II (Fig. 5:18), a jar from the Early Roman period (Fig. 6:9) and a bowl from the Late Roman or Byzantine period (Fig. 6:15). Squares B5, B6 (Figs. 3, 8). Beneath a fill of small stones and alluvium (thickness 0.5 m) were two adjacent walls (W114, W121) that were constructed on alluvium. Wall 114 (Fig. 9) was stepped, built of three rows that descended to the south. The bottom row consisted of a combination of medium-sized fieldstones and boulders; the middle row was built mostly of fieldstones; and the upper row—only partly preserved—was built of boulders. Its core, which consisted of small and medium fieldstones and a small amount of alluvium, was exposed at the western end of the wall. The construction of W121 (Fig. 10) was less carefully constructed than W114. Its southern face was constructed of two stepped rows: the bottom one built of large fieldstones and boulders, and the upper one—mainly of medium-sized fieldstones. Its northern face was built of medium and large fieldstones; only the upper part of this face was exposed, but it seems that it too was stepped. The core of the wall consisted of small and medium-sized fieldstones. The dimensions of the two walls are similar, although not identical, and are not built along the exact same axis. Therefore, it seems that they were not constructed at the same time. No connection was discovered between the walls, and the collapse between them was possibly the remains of such a connection. The location of the walls in the flood plain between Tel Bet Shemesh and Nahal Yishʽi suggests that they may have been used to divert water to agricultural plots, but the absence of any trace of fluvial deposits on the surface of the walls and their placement on wet alluvium contradicts this assumption. The unearthed pottery included a bowl from the Early Roman period (Fig. 6:3) and a jar that was common throughout the Roman period (Fig. 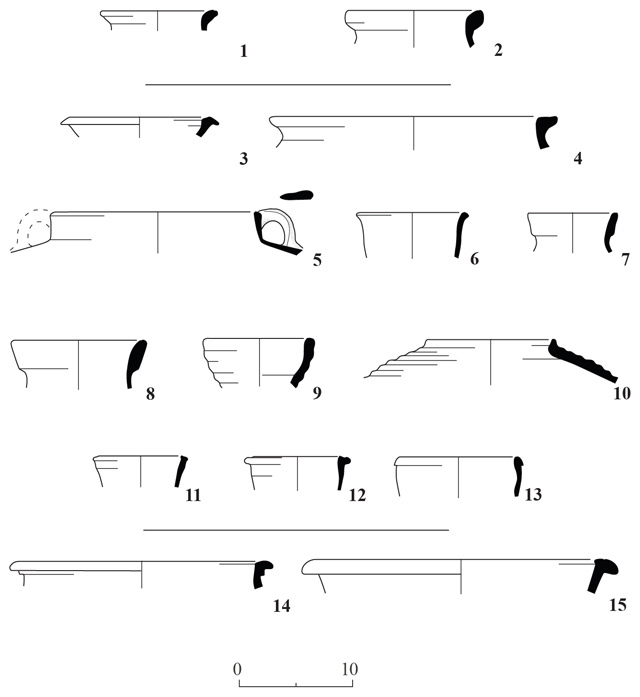 6:13), as well as pottery sherds from the Iron Age II and the Byzantine period (not drawn). Square I19 (Fig. 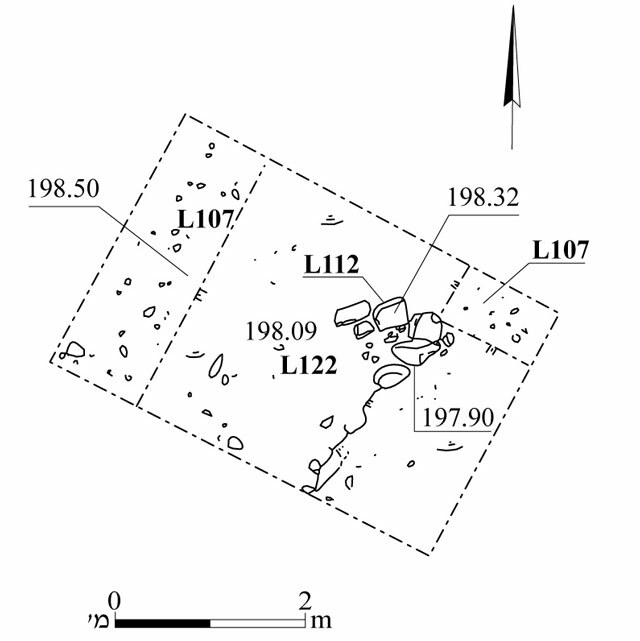 11) yielded several medium and large stones (L112), possibly debris from a collapsed wall. The stones were discovered beneath a thin layer of alluvium. Some of the stones were revealed in white calcareous soil that probably originated in weathered limestone or chalk. 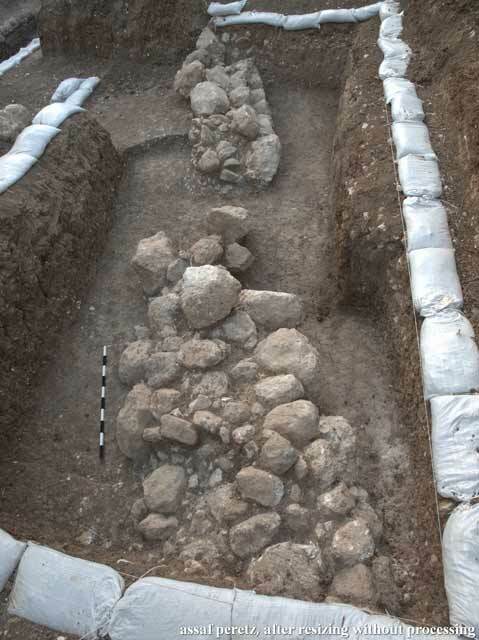 The field walls discovered in the excavation, the heavy alluvium soil suitable for farming and the ceramic finds indicate that the site constituted part of the agricultural hinterland of the settlements of the region, including Tel Bet Shemesh and Horbat Gannim, during the Iron II, Hellenistic, Roman and Byzantine periods. Sion O. and Rapuano Y. 2017. Horbat Gannim. HA-ESI 129. 3. Squares A3, A5, B5, B6, plan and sections. 4. Squares A3, A5, looking southeast. 5. Iron Age II pottery. 6. Pottery from the Hellenistic, Roman and Byzantine periods. 7. Squares A11, A16, plan and sections. 8. Squares B5, B6, looking southeast. 9. Wall 114, looking north. 10. Wall 121, looking north.